I wrote this book because I know how to play outfield and I want to share my knowledge with ballplayers and coaches. I learned outfield defense through years of playing at the top levels of the game. I have coached thousands of young players after I hung up my cleats. Thousands upon thousands of repetitions and drills solidified my playing skills and polished my coaching techniques. This book contains very specific movements and positions an outfielder must learn to be a good defensive player. The text is supplemented with 118 photos and diagrams that illustrate the techniques and visually reinforce the text. Click on book cover above to be directed to the bookstore. 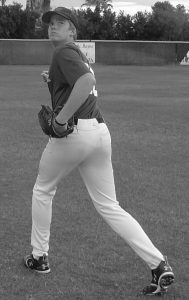 The book starts with simple, yet vitally important, fielding techniques. 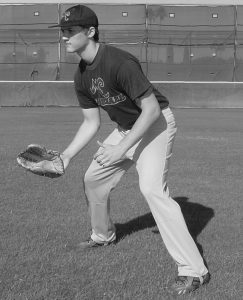 Both ground ball and fly ball fundamentals are extensively covered. The fundamentals in these chapters emphasize footwork and balance. 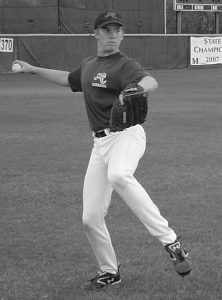 They also show critical movements that increase the odds of catching the ball and throwing with accuracy and strength. Throwing the ball and running are very important tools for an outfielder. 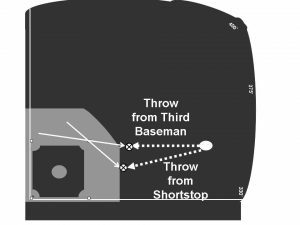 With so much area to cover, and distances to throw, outfielders need every movement to be optimized. The book contains throwing and running fundamentals and drills to improve a player’s skills. Further chapters explain more sophisticated aspects of outfield play. We will teach you how to read a batted ball, get a good jump, and take the correct angle to the ball. You will learn the proper methods for dealing with the wall (or fence). The book illustrates the best ways to get to balls hit over your head, the warning track – even when there isn’t one. And you will learn and understand why some batted balls have sometimes crazy spin. Lastly, team defense and communication are explained in diagrams and examples. 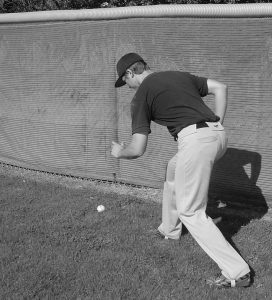 An outfielder must know both to complement his or her skills. Even though every player is tested as an individual, they each play an important part of a greater whole – the team. 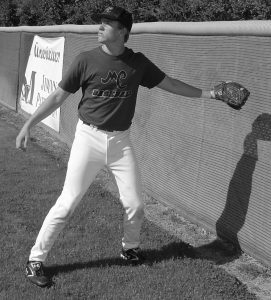 Each chapter has drills that players and coaches can use to learn the fundamentals of outfield defense. The drills in this book are easily done with minimal use of apparatus – gimmicky and expensive contraptions that may or may not help the player. I do this on purpose because I know my drills work, if the player works at them. I also wanted to provide drills that anyone, regardless of finances, can do and afford. Baseball is America’s game and everyone should be allowed the privilege of learning and enjoying it. Woven throughout the book are funny and poignant stories from my playing career and from the rich mosaic of baseball history. The book is very easy to read for both youths and adults alike. In the middle of September 2008, I sat down and wrote one-line descriptions on everything I knew about outfield play. I didn’t try to organize my thoughts, and I didn’t care what the outfield subject was – it was just a freestyle exercise to dump every aspect of outfield play from my brain. This book is the result. Writing this book is one of the most pleasurable activities I have ever done. I hope it benefits you as much as it has helped me. See you at practice. Outfielder circles the ball at the fence.